Larry Dyke has long been known for his magnificent waterfalls including Niagara, Cumberland, Victoria, and Iguassu Falls. He has traveled the world to experience them first-hand. But Falling Water I is a totally new approach for the artist who has spent his life perfecting the art of painting moving water. This very contemporary approach takes the waterfall out of the normal "landscape" category and shows it to us in a new and exciting way. 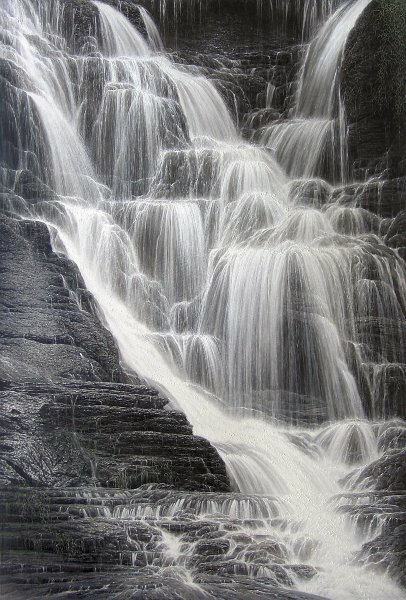 In effect, it is the painting of the design of the water as it falls in rivulets, droplets and cascades. It shows the myriad of ways water can "fall" in any waterfall. It is a microcosm of the life of water - the life water takes on as it moves relentlessly in nature.